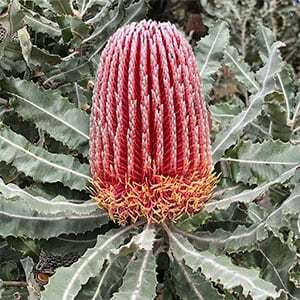 With the common name of Firewood Banksia, Banksia Menziesii is available in two forms, a tall shrub or tree or a dwarf form. With large cone shaped flowers an orange to red in colour, and good textured foliage this makes a great garden plant, especially the smaller growing forms. The taller form will reach up to 10 metres in height (30ft). the dwarf or prostrate fprmwill reach around 1 metre which makes it a more useful garden plant for many. The taller form can be pruned, this is a species with a lignotuber, so it can be coppiced and will reshoot. This is where the common name of Firewood Banksia comes from. In an open sunny position and a well drained soil this is an easy plant to grow. Once established this is a drought tolerant plant with attractive flowers. The lignotuber, means it can be copiced to promote new growth, more flowers and maintain a smaller size. Soil – Well drained, deep sandy soils are best. Height – To 10 metres. Dwarf varieties are available. Flowers – Pink to an Orange/Red cone like. Flowering time – From autumn to winter.